A deeper look at the grooves pressed into the Choke Cherry Tree LP by Ben Miller Band. The catch, when any band attempts to infuse a time-honored sound and style with new energy and fresh inspiration, is that they often lose sight of all the reasons why and how that form worked in the first place. While the heart and hopes might sound enough, the results often feel as though someone has tried to weld the fins from a ’57 Chevy Bel Air onto a 2018 Malibu under the reasoning that, “Both are cool so putting them together could only make the result even better, right?” Well, the results can be incredibly awkward unless the group in question has the discipline and common sense to not overwork their inspiration or take it too far. Most bands don’t have that kind of discipline and the results they produce can be wretched, but everything can go right once in a while and, when that happens, the band will have something truly rare and remarkable on their hands. 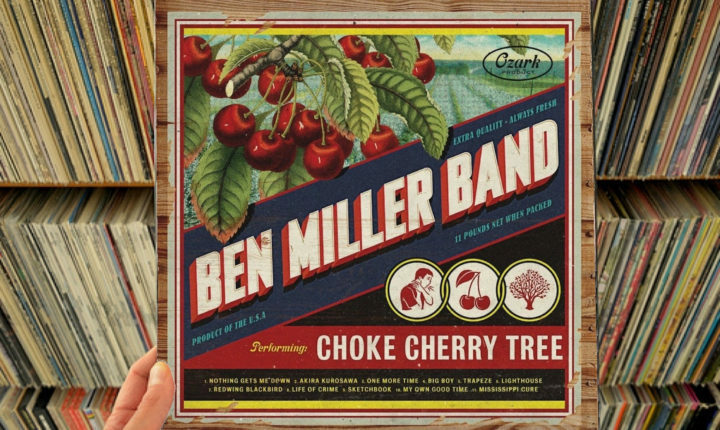 Such an occasion is exemplified by Choke Cherry Tree, the fifth album from Ben Miller Band (second on New West Records); from top to bottom, the album is packed with punk anthems and spirit, but performed in a far more back-woods and folky style. It’s wild to hear the band balance between obviously acoustic and folk-informed instrumentation and a clearly ‘punk’ spirit – and is even better for the fact that it always thrills and never falters. Those who have never heard Ben Miller Band before but know the group by reputation will finds themselves rushing toward Choke Cherry Tree, but the band ensures that everyone’s paying attention by playing against type and just hitting the ground walking as “Nothing Gets Me Down” opens the A-side. This start is guaranteed to have listeners doing a double-take; it is in no way fast-paced, but lyrics like “The other night I got so fucked up/ I was peeing in the sink and fell in the tub/ I don’t let nothing get me down/ I was stayin’ in the tub with my junk hung out and the shower curtain ’round me like an Arab shroud/ I don’t let nothin’ get me down”definitely place the song squarely in the punk arena – so listeners are guaranteed to be in close to hear more. When they move in, they’ll discover that the bass they’re hearing feels nearly bottomless (no shock – it’s a homemade, one-string washtub bass) while the haunting but beautiful sonics produced by multi-instrumentalist Rachel Ammons are incredibly comforting and Scott Leeper’s drums are spare but beautifully propulsive. It’s an unbelievably tight package, but the crown jewel is Miller himself; his back home drawl is unassuming and hypnotic and, as they listen, those who pick up the album will find themselves utterly won by “Nothing Gets Me Down.” It’s unassuming and perfect. And the side’s running only gets better from there! After “Nothing Gets Me Down” fades out, Ben Miller Band’s energy levels escalate consistently as the A-side unfolds. First, “Akira Kurosawa” sees the band turn both the volume and the energy up from ‘one’ to ‘ten’ as they issue a glorious roots-rock salvo in a style similar to that of “Bellbottoms” by Jon Spencer Blues Explosion (but with a fuller lyric sheet). Next, the band stomps through a great rocker in the form of “One More Time” before “Big Boy” drops a drum performance as explosive as its namesake and “Trapeze” adds some cajun spice to an old-timey number for a different flavor. When the A-side ends with a “peace in the valley”-styled ballad called “Lighthouse,” listeners will take the moment for a breather and to rally enjoy the nuance of the song. It is a truly beautiful one; between the piano which guides the song and Miller’s genuine and truly sweet vocal performance, listeners may find that they need to restrain themselves from letting out a heavy and impassioned sigh. Now, the A-side really introduces the band at their best and brightest, and there’s no question that it’s a hard act to follow – as the B-side of Choke Cherry Tree proves. That is not to say that there aren’t solid moments – “Sketchbook” has some passion as it wanders though a wedding ceremony while “Redwing Blackbird” sees Ammons steal the mic and make the band her own for the amount of time it takes for that one song to play out, but listeners may actually find themselves getting ready to gripe that there isn’t quite enough generic tampering here; they may argue that, yes, it’s good but just a little too safe compared to its counterpart. Simply put, the fins on the B-side just aren’t big and garish enough. The Choke Cherry Tree LP is out now. Buy it here on Amazon.